Optional Tour June 27th – July 1st. 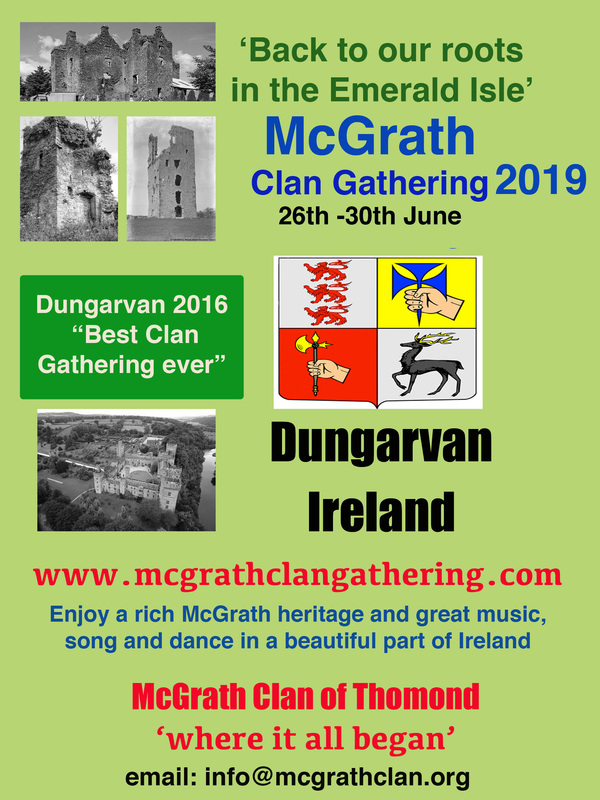 There is less than 4 months to the 2016 McGrath Clan Gathering and Dungarvan is looking forward to hosting our event. At the moment, we have people coming from the USA, Canada, Australia, New Zealand, South Africa and the UK for gathering of our clan and some are also taking in the post event tour. We have put together a full time table of events for the four days. It includes talks/lectures, including the official launch of the McGrath DNA Project, BBQ, tour to places of McGrath heritage, great traditional music and the Clan Dinner. There will be a few additions to the time table in due course. The Park Hotel, Dungarvan, is the base for the weekend. Dungarvan is a beautiful town on Ireland’s south coast and has lot attractions for all the family. If you wish to join us in Dungarvan for the event, you can register by going to http://www.mcgrathclangathering.com and paying the €98 fee. You will also need to send an email with the required registration information. If you wish to take part in the post event tour, follow the instruction below. There will be a genealogist available during the weekend but we would advise that you make contact with her prior to your visit. We have details of other genealogists which may suit your needs better, depending where in Ireland you have been able to trace you family tree. One of our guest speakers will be Fr Paddy Ryan, who wrote the book and is an expert on the infamous Miler Magrath, one of the most famous McGraths in Irish history. You can pay the fee for the gathering (€98) on the link on our website. There are a limited number of places still available on this tour. It costs €495, with a €40 supplement for a single room. Due to the commission charged, we are only looking for a €200 deposit and the balance can be paid on arrival in Dungarvan. Just send an email to danmcgrathmedia@gmail.com and we’ll send out a PayPal request for the €200. Otherwise, we would have to charge an extra €60 per person. There are some rooms available in the Park Hotel, which is our base for the weekend and there are a number of rooms available in B&B’s around the town. The Park Hotel is also offering a special rate for those who wish to only stay in the hotel on the night of the Clan Dinner. Contact emails are on website and keep an eye on Facebook for updates. We will be launching the official McGrath DNA project of the Sunday afternoon of the gathering. This is a major step forward and we are delighted that it’s finally happening. There are a number of award winning restaurants in Dungarvan which you may like to visit. If anyone wishes to go for a round of golf during their stay in Dungarvan, this can be arranged. There are also a number of nice walks, in or close to town, including beach and forest walks. We would appreciate early registration and payment of the relevant fee. Thanks to all the people who have registered already. Please drop us an email if you have any question or need any help or advice. Please forward this email to anyone who may be interested. If you wish to be removed from this mailing list, please let us know. We look forward to welcoming you all to Dungarvan in June. This entry was posted in Uncategorized on March 2, 2016 by McGrath Clan (official).